The video of PNZ National Women's Triples final is now on the Wellington Pétanque YouTube channel. Due to player unavailability Hataitai has forfeited their match against Wanganui East which was scheduled for 12 March. Wanganui East's first defence is away to Kapiti. 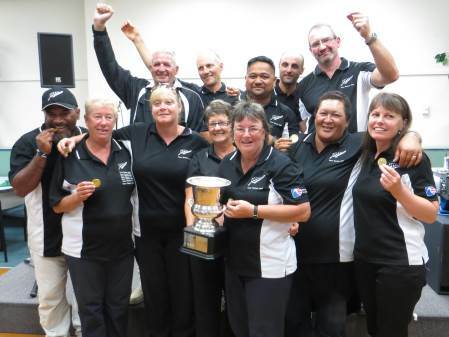 Twenty-two teams are taking part in the PNZ National Triples Championship at Manawatu. The top two qualifiers in the Women's Shooting were Sharon Cannon (22 points) and Ann Shields (18). The top two qualifiers in the Men's Shooting were Maurice Belz (39) and Paul Tamagushiku (24). WPA President Kevin McFadgen (Kapiti) was elected to the PNZ Board at the Annual General Meeting in Manawatu. Kevin replaces Sarah-Jane Wright (St George) who stepped down after 5 years on the Board. Barrie Anderson (Northcote) was re-elected to the Board. Richard Hambleton (Tairei) was the unsuccessful candidate. David Corley (Manawatu) and Dave Gatchell (Horowhenua) werre presented with their Club Umpire certificates at the PNZ AGM in Manawatu. Both completed their Club Umpire training and assessment at a Training clinic run by National Umpire Trevor Neilson late last year. Maurice Belz (Bay View) won the Men's Shooting competition (Tir de Précision) from Paul Tamagushiku (Christchurch). The Women's competition was won by Ann Shields (Herne Bay) from defending champion Sharon Cannon (Bay View). The curse of the undefeated top qualifier struck again on Sunday morning as Richard, Neville and Brian were unable to navigate their way out of the barrage round. Instead they found themselves in the Trophy Consolation knockout. Meanwhile, the eighth ranked team of Allan Fletcher, Pam Jenkins and Richard Swaney showed their mental toughness as they battled their way back from a first game 13-1 drubbing to reach the Championship final. 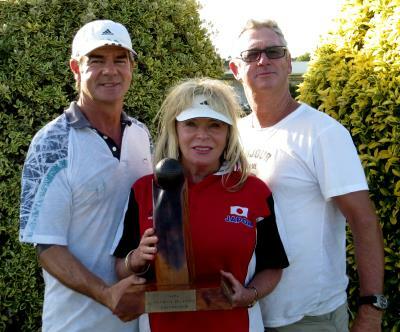 In the final they faced the Hawke's Bay team of Dez Grant, Lee Taffard and Sarah-Jane Wright. Interestingly, both top qualifiers from the morning round failed to progress past the knockout. Perhaps sitting out a game and then waiting for the Shooting final to complete was just too long a break. The final was a real see-saw battle and in the end it was Allan, Pam and Richard who prevailled 13-9. Back in 2007, Murray Porter mentioned that it was long time between drinks from his first National Triples to his second. Richard beat that record with an 11 year break, but Pam has created a record that is probably unlikely to be broken with a 20 year gap between her first and second National Triples title. While the winners celebrated, spare a though for Lee Taffard. This was his fourth Triples final and he is still to register his first win. Video of the final and the Shooting competition will appear on the YouTube channel soon. Unfortunately, a technical issue with the camera has meant that the picture quality is a little poor. Over the years the Kapiti Pétanque club has embarked on several major upgrades to the club's facilities. The video of PNZ National Men's Shooting Competition final is now on the Wellington Pétanque YouTube channel. 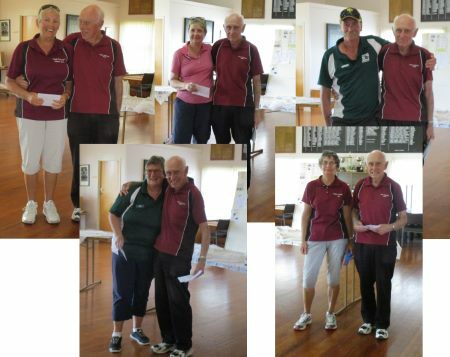 Twenty teams took part in the 14th Upper Hutt Swiss Doubles at Maidstone Park. After four rounds, Jean Boughen and Betty Jackson werre the only undefeated team with six teams just behind on 3 wins. In the final round, Jean and Betty faced Moises and Michael. A win would give them the tournament outright, a loss would come down to tie-break. After the dust had settled, four teams had four wins and it was Moises, in his first ever tournament, and Michael who took the Trophy ahead of Alan and Marc. Jean and Betty were relegated to fourth behind Len and Bob. Information out of Vanuatu has been sketchy. Georgio Vakauta won gold in the Men's Pointing competition and Claire Bradburn, Margaret Maher and Jean Parley won gold in the Women's Triples. A brief report is now on the PNZ website. 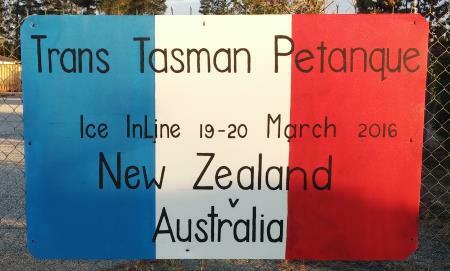 The 14th annual Trans Tasman match is being held in Alexandra, Central Otago. The first day comprised gender Triples and Doubles. In the Open section, NZ leads Australia by 40 points to 20. In the Senior section, NZ leads by 38 points to 22. There have been a few changes to the make up of the teams since they were first announced. Richard Browne, Sharon Cannon, Bruno Falco, Christian Fouquet, Annick Le Guen, Stephane Montel, Junior Puleitu, Christine Strichen, Georgio Vakauta, Ruby Vakauta, Kathleen Wallace, Claire Wilson. Claire Bradburn, Marilyn Bunce, Neville Frost, Kay George, Lewis Gill, Pete Hamilton, Shirley MacDonald, Margaret Maher, Graeme Morris, Sheryl Parslow, Bill Peachey, Ray Pierce. Harold Dercy, Kim Douglas, Lynn Dufresne, Patrick Defresne, Pascal Dufroux, Vick Khadaroo, Bridie Kinghorn, Kate Mangan, Shirley Marshall, Bronson Romani, Monique Tourneur, Dom Welsh. Lillian Caruana, Max Chaperon, Danny Green, Lindsay Kinghorn, Medgee Lebrasse, Walter Lubtschenko, Danielle Marchand, Margaret McCormick, John Rowe, Jenny Silva, Gilbert Tourneur, Judy Whiteaker. The Mixed Triples on Sunday morning were convincingly won by NZ (7 games to 1) and the match was sewn up by lunch time. Australia performed better in the afternoon's Mixed Doubles going down 8 games to 10. The final score saw NZ beat Australia 81-39 to retain the Trans Tasman Cup. NZ lead the competition 11 matches to 3. This was the ninth consecutive win by NZ. Australia's last win was back in 2007 in Melbourne. The Mixed Triples were much closer in the Seniors with NZ heading Australia by 5 games to 3. However, NZ came into their own in the Mixed Doubles winning 13 games to 5 and wrapping up the match with two rounds to spare. New Zealand leads the Senior competition 9 matches to 3. 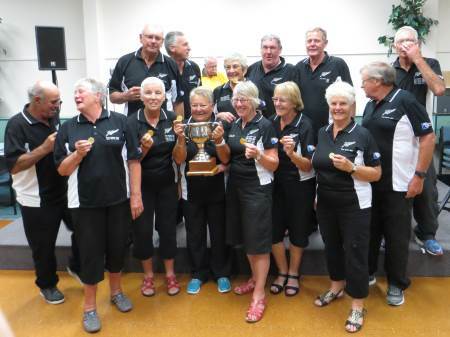 Australia last won the Senior division in 2014 in Rotorua. 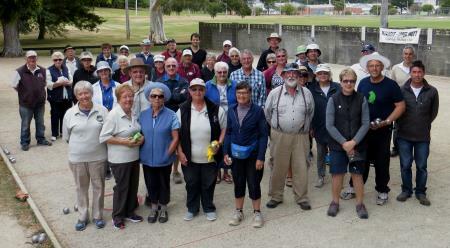 The video of WPA Regional Triples Championship final is now on the Wellington Pétanque YouTube channel. 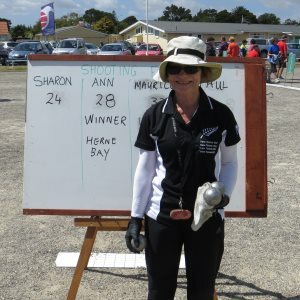 The video of PNZ National Women's Shooting Competition final is now on the Wellington Pétanque YouTube channel. Sixty players from the lower North Island enjoyed the sunny weather and warm hospitality at the Otaki Pétanque Club's Easter Melee held on Saturday, 26 March. We welcomed several, very new to the sport, players to their first melee and a good time was had by all.